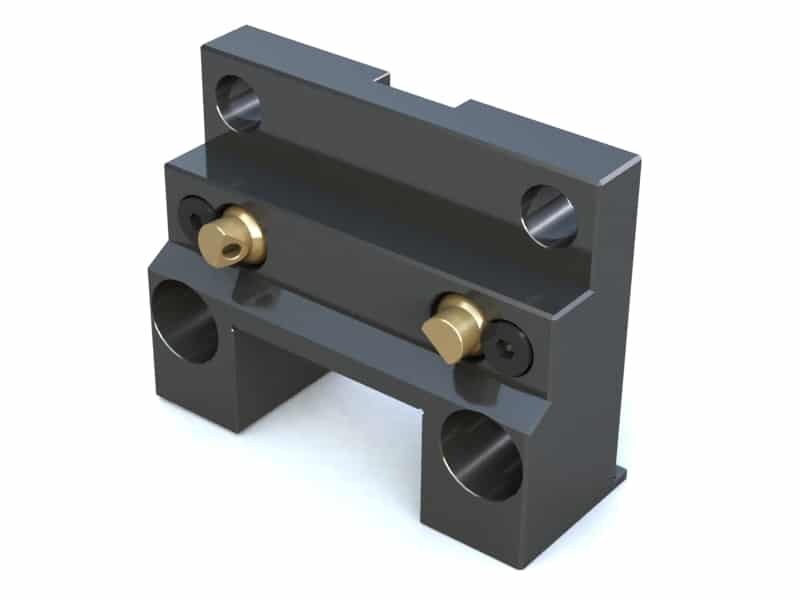 Tool Holder Blocks » Rovi Products, Inc.
Bolt On Tool Blocks (Lathe Mounting Blocks & Block Tool Holders) for all types of Machines; New or Old. 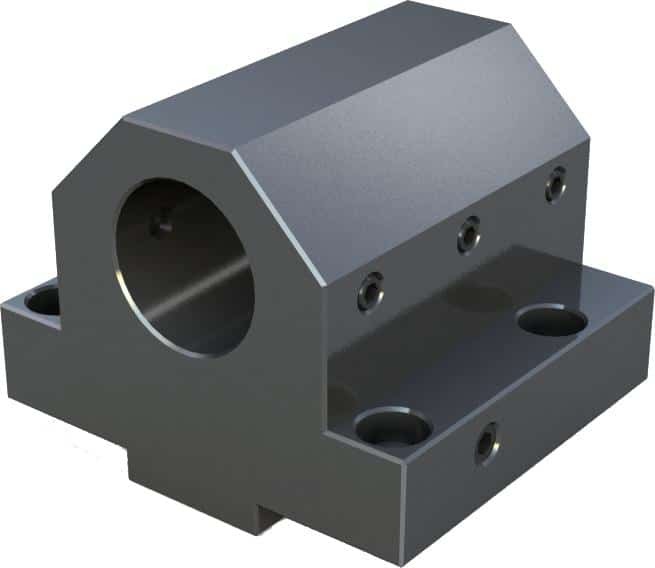 Block Tool Holders have a specific Bolt Hole Pattern unique to each Machine Make and Model. 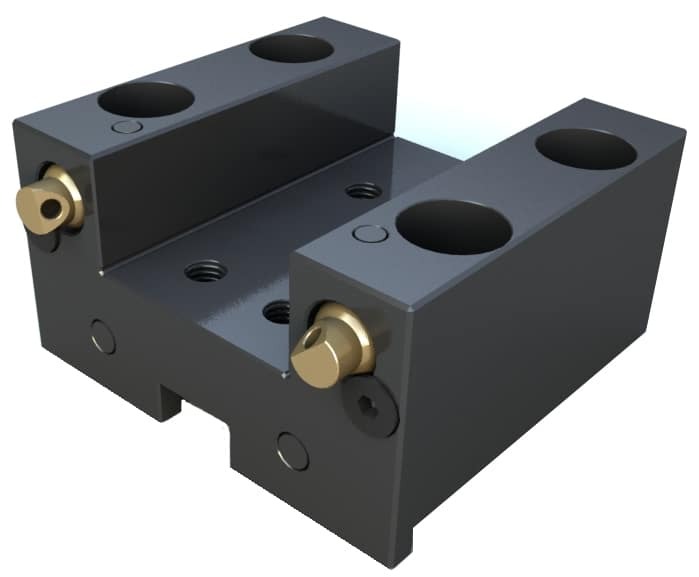 Select Block Tool Holders from list below. If you do not see your Machine Listed contact us at 800-423-5145. We sell Blocks for Every Machine. 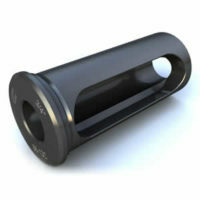 Made From Alloy Steel; Precision Machined and Ground. 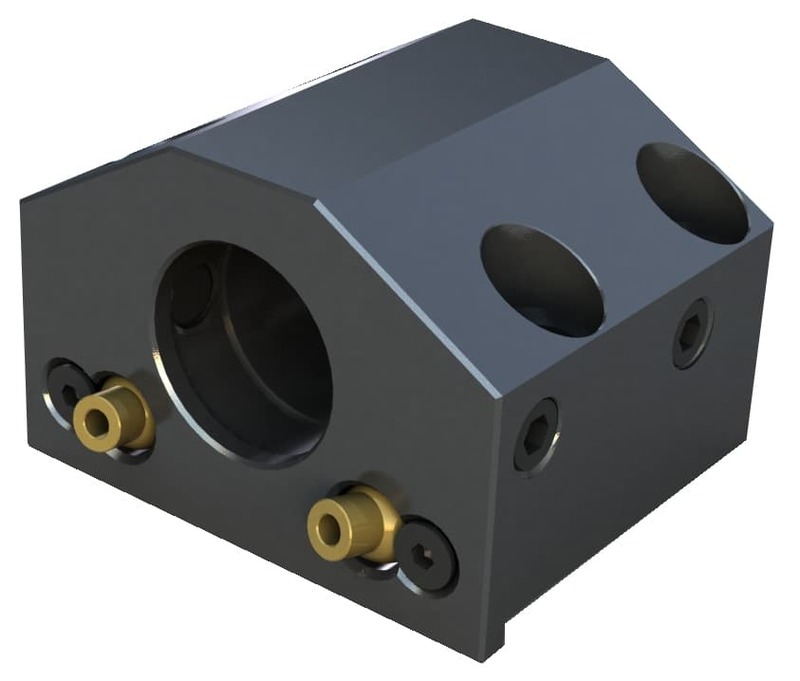 High Pressure Coolant Nozzles. 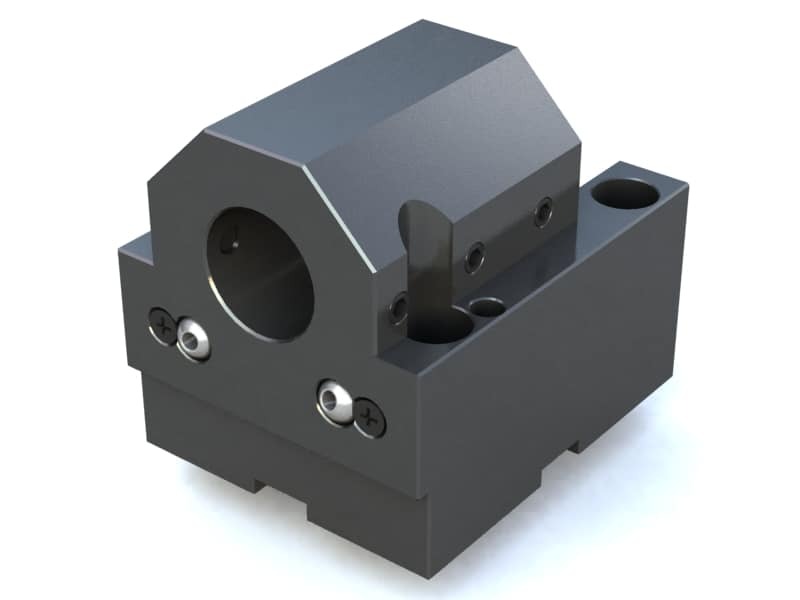 Internal Coolant Option available for all ID Tool Blocks; add “INT” to the Part Number. 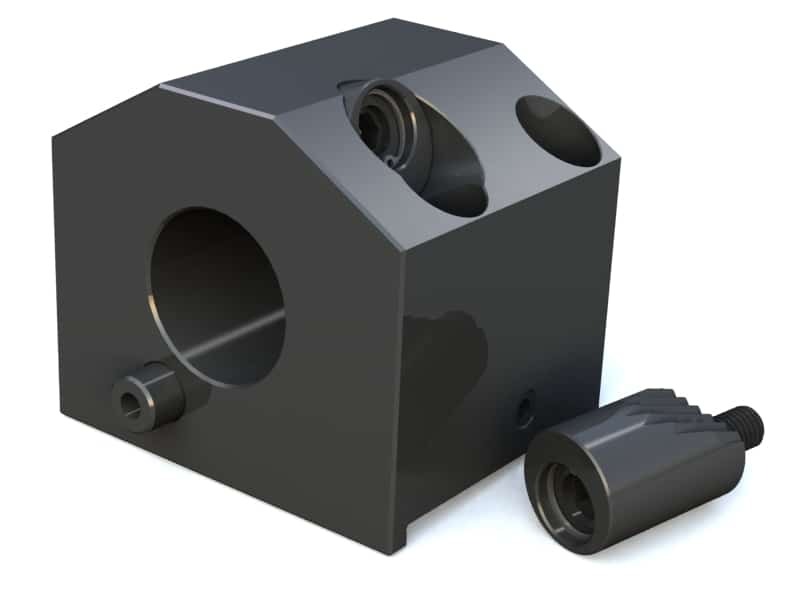 VDI ID Block Tool Holders; convert your standard Bolt On Block Lathe to a VDI Turret. 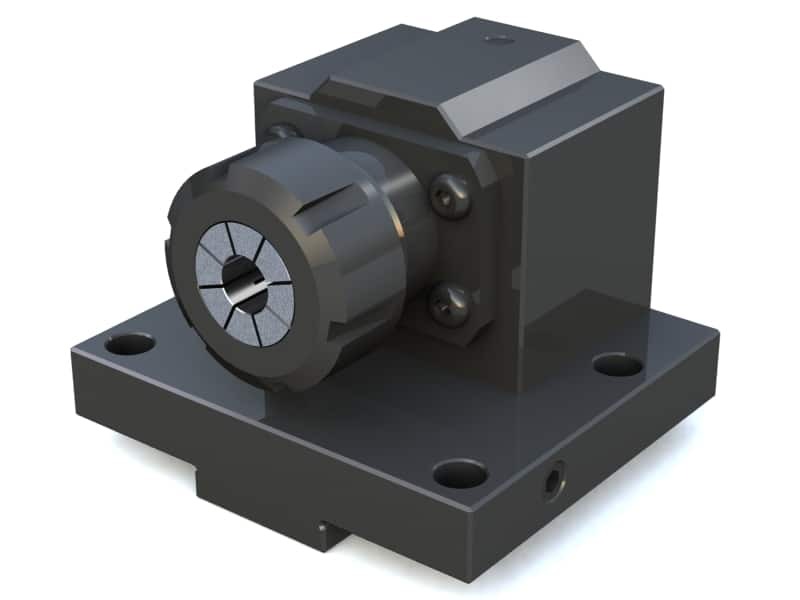 ER 32 Collet ID Tool Blocks; offered in Standard Style and Recessed Style (Shown Below). Need to Hold a Very Long Bar; we can make any ID Tool Block “Extended Style” – Increase your Gripping Power! More ID Sizes Available – We make a variety of ID sizes Standard for All Blocks – Call for Listing & Prices! Cadet, Captain 370, ESL8, ESL10, Heritage LB-15, LB15IIM, LB250T, LU25, LU15, Crown LB25, CAP470, L1420, LB4000EXBB/1500, L470, Genos250-V8, LB3000**, LU4000** A118-8420 DBL 0.75″ 1.25″ A118-8311 1″ Sq. A118-8411 1″ Sq. LB35, LU35 LB35-8435 1.5″ 1.375″ LB35-8311 1″ Sq. LB35-8411 1″ Sq. LB45, LU45 LB45-8435 1.5″ 1.625″ LB45-8311B 1.25″ Sq. LB45-8411B 1.25 Sq. LB2000, LB2500, LB3000, LB3000EX LB3000-8416 0.625″ 90mm LB3000-8311 1″ Sq. LB3000-8411 1″ Sq. LB3000-8420 0.75″ 90mm LB3000-8311 DBL 1″ Sq. LB4000, LB4000EX LB4000-8432 1.25″ 90mm LB4000-8311 1″ Sq. LB4000-8411 1″ Sq. LB4000-8435 1.5″ 90mm LB4000-8311 DBL 1″ Sq. LB-9, LB-10, GenosL250V12, ESL6 Heritage LB9-8420 0.75″ 1″ LB9-8311A .75″ Sq. LB9-8411A .75 Sq. LC20 LC20-8432 1.25″ 1.25″ LC20-8311 1″ Sq. LC20-8411 1″ Sq. 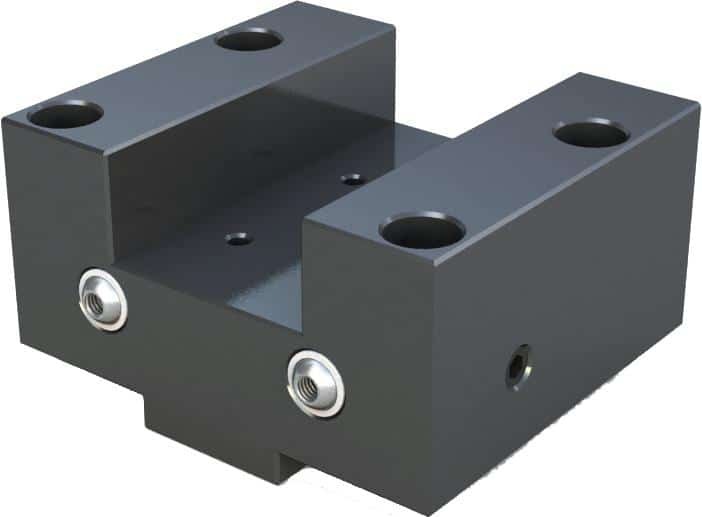 LC30 LC30-8436 2″ 1.625″ LC30-8311/8411Combo OD Holder 1″ Sq. LC40 LC40-8436 2″ 1.625″ LC40-8311B 1.25″ Sq. LC40-8411B 1.25″ Sq. LFS12 LFS12-8432 1.25″ 115mm LFS12-8311 1″ Sq. LFS12-8411 1″ Sq. CL15, CL20, SL135, SL150, SL154, ZL15 MSL150-8432 1.250″ 35mm MSL150-8311A .75″ Sq. MSL150-8411A .75″ Sq. CL25, CL200, CL253, CL2000, DT1500, DT1530, DT2550, SL200, SL203, SL204, SL250, SL253, SL300, SL303,, VL25A1, ZL25, ZL200, ZL250, ZT2500, Duraturn 2050,, SL20, SL25, SL30, SL2500, NLX2500, Frontier MSL20-8425 1″ 40mm MSL20-8311 1″ Sq. MSL20-8411 1″ Sq. MSL20-8432 1.25″ 40mm MSL20-8311 DBL 1″ Sq. SL35, TL40-10ST, ZL35, Samsung MSL35-8435 1.5″ 40mm MSL35-8311 1″ Sq. MSL35-8411 1″ Sq. SL45, SL400, SL403, SL405, VL55, ZL45 MSL403-8436 2″ 50mm MSL403-8311B 1.25″ Sq. 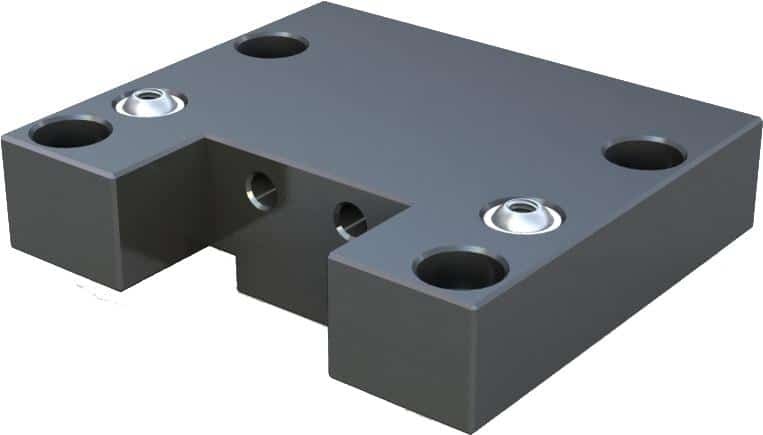 MSL403-8411B 1.25″ Sq. SL6, SL65, SL600, SL603, MSL75 MSL603-8437 2.5″ 60mm MSL603-8311B 1.25″ Sq. MSL603-8411B 1.25″ Sq. MSL603-8475 3″ 60mm MSL603-8311 1″ Sq. Double NZ2000-8311A .75″ Sq. NZ2000-8411 1″ Sq. † NZ2000-8432 1.25″ 100mm NZ2000-8311 1″ Sq. Double NL3000-8311 1″ Sq. NL3000-8411 1″ Sq. NL3000-8435 1.5″ 80mm NL3000-8311 DBL 1″ Sq. ST20, DS30, ST30SS HST20-8420 0.75″ 40mm HST20-8311A .75″ Sq. HST20-8411A .75″ Sq. SL-10, ST10, HT10 HSL10-8420 0.75″ 1″ HSL10-8311A .75″ Sq. HSL10-8411A .75″ Sq. SL20, SL30, ST30, ST31, TL15, TL25 HSL30-8425 1″ 1.25″ HSL30-8311 1″ Sq. HSL30-8411 1″ Sq. SL-40 HSL40-8436 2″ 1.625″ HLS40-8311B 1.25″ Sq. HSL40-8411B 1.25″ Sq. Nexus100/150, QT8, QT150, QT250 NEX100-8425 1″ 1″ NEX100-8411 1″ Sq. Bridgeport QT8, QT15/18, QTN15, SQT250, QT200, Romi M27, NEX150-8D, DualTurn 20 QT, Nexus250 Duplomatic, QT Nexus 200, QT Nexus 350, QT Nexus 300, QT20, QT Nexus 2000 NEX350-8420 0.75″ 50mm NEX350-8311 1″ Sq. NEX350-8411 1″ Sq. NEXUS 400, NEXUS 450 NEX450-8435 1.50″ 2″ NEX450-8311B 1.25″ Sq. NEX450-8411B 1.25″ Sq. QT25, QT28N, QT30, QT300 QT30-8435 1.5″ 2.25″ QT30-8311 1″ Sq. QT30-8411 1″ Sq. QT35N, QTN40, QT350 QT35-8435 1.50″ 2″ QT35-8311B 1.25″ Sq. 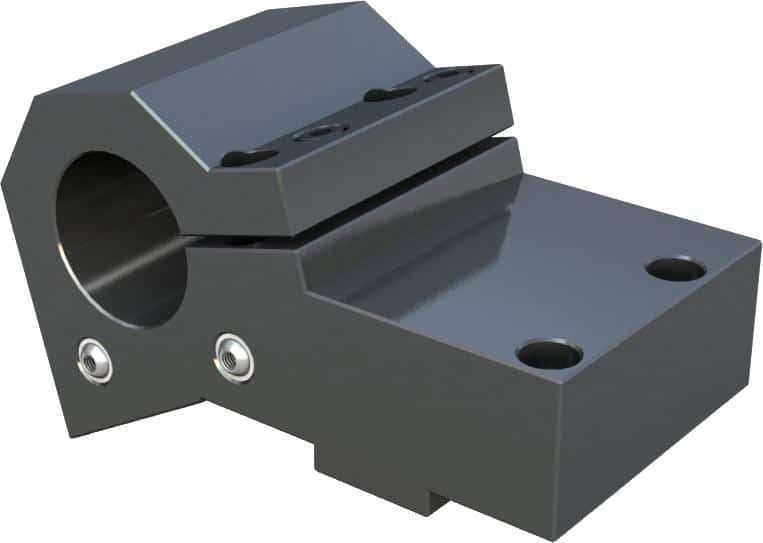 QT35-8411B 1.25″ Sq. QT200, QTN250, Smart250, Smart200 QT200-8432 1.25″ 2″ QT200-8311 1″ Sq. QT200-8411 1″ Sq. Doosan BMT45, Turret, Lynx 220 BMT45-8425 1″ 65mm BMT45-8311A .75″ Sq. BMT45-8411A .75″ Sq. Doosan BMT55, Doosan TT18SY, Doosan TT1800Sy, Puma 2000 BMT55-8432 1.25″ 70mm BMT55-8311 1″ Sq. BMT55-8411 1″ Sq. BMT55-8435 1.5″ 70mm BMT55-8311 DBL 1″ Sq. Doosan BMT65, Puma 3100, Doosan 2600ms, Doosan TT2500SY, Puma V400, Puma V300M Puma400MB, Puma 300LM BMT65-8435 1.5″ 100mm BMT65-8311 1″ Sq. BMT65-8411 1″ Sq. BMT65-8436 2″ 100mm BMT65-8311 DBL 1″ Sq. Doosan BMT75, Puma V550, Puma 400 BMT75-8436 2″ 60mm BMT75-8311 1″ Sq. BMT75-8411 1″ Sq. BMT75-8437 2.5″ 60mm BMT75-8311 1.25″ Sq. BMT75-8411 1.25″ Sq. Puma 200, Puma 240C, With Locator Keyway Puma200K-8435 1.5″ 40mm Puma200K-8311 1″ Sq. Puma200K-8411 1″ Sq. Puma 200, Puma 240C, With Locator Slot Puma200S-8435 1.5″ 40mm Puma200S-8311 1″ Sq. Puma200S-8411 1″ Sq. Puma 300, Puma 250L, Puma 300L, Daewoo 12, With Locator Slot Puma300S-8435 1.5″ 40mm Puma300S-8311 1″ Sq. Puma300S-8411 1″ Sq. Puma 300, Puma 250L , Puma 300L , Daewoo 12, With Locator Keyway Puma300K-8435 1.5″ 40mm Puma300K-8311 1″ Sq. Puma300K-8411 1″ Sq. H4 HB4A-1 1/2 1.5″ 40mm HO4A-1RL 1″ Sq. HF4A-1RL 1″ Sq. H6 HB6A-1.50 1.5″ 40mm HO6A-1RL 1″ Sq. HF6A-1RL 1″ Sq. HB6A-2 2″ 40mm HO6B-1RL 1″ Sq. HF6B-1RL 1″ Sq. H8 HB8-1.50-N 1.5″ 155mm HO8-1L-N 1″ Sq. HF8-1RL-N 1″ Sq. HB8-1.75-N 1.75″ 155mm HO8-1R-N 1″ Sq. H8A HB8A-1.75-N 1.75″ 120mm HO8B-1RN-N-W 1″ Sq. HF8A-1RN-N-W 1″ Sq. H10 HB10-1.50-N 1.5″ 110mm HO10-1RL-N-W 1″ Sq. HF10-1RL-N-W 1″ Sq. HB10-1.75-N 1.75″ 110mm HO10-1.25-N-W 1.25″ Sq. HF10-1RL-N-W 1.25″ Sq. H10A HB10A-2 2″ 120mm HO10A-1 1″ Sq. HF10A-1 1″ Sq. † HB10A-2.5 2.5″ 120mm HO10A-1.25 1.25″ Sq. HF10A-1.25 1.25″ Sq. * HO10B-1 1″ Sq. * HF10B-1 1″ Sq. * HO10B-1.25 1.25″ Sq. HF10B-1.25 1.25″ Sq. H12 HB12-1.50-N 1.5″ 105mm HO12-1RL-N-W 1″ Sq. HF12-1RL-N-W 1″ Sq. H22 † HB22-2-N 2″ 128mm HO22-1RL 1″ Sq. HF22-1RL 1″ Sq. 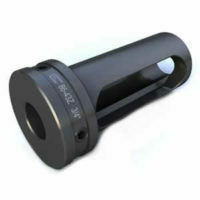 † HB22-2.50-N 2.5″ 128mm HO22-1.25RL 1.25″ Sq. HF22-1.25RL 1.25″ Sq. HB9 HB9-1.25 1.25″ 130mm HO9-.75 .75″ Sq. 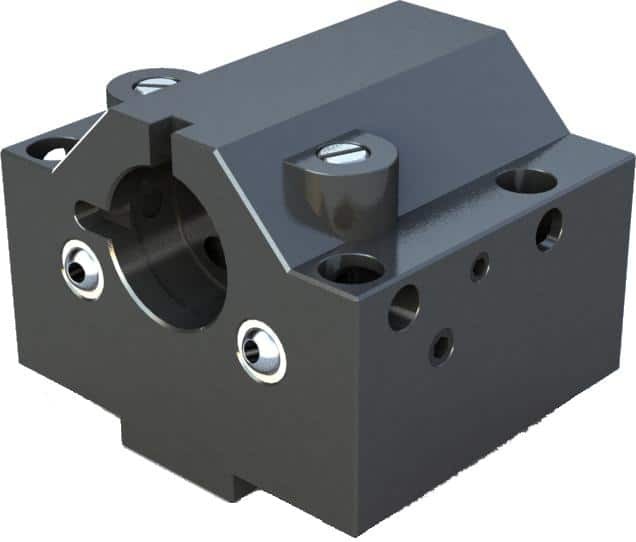 HF9-.75 .75″ Sq. HB23 HB23-1.5 1.5″ 43mm HO23-1RL 1″ Sq. HF23-1RL 1″ Sq. TW-10, WTS150, WTW150, SC200, SC250, SUPER NTJ, SUPER NTJX,, SUPER NTM3, TMC15, WT250 TW10-8425 1″ 75mm TW10-8311A .750″ Sq. TW10-8411A .750″ Sq. TW20, Super NTX, Super NTXS, SC-300, WT300 TW20-8435 1.5″ 90mm TW20-8311 1″ Sq. TW20-8411 1″ Sq. TW30, SC-450 TW30-8435 1.5″ 105mm TW30-8311 1″ Sq. TW30-8411 1″ Sq. More Tool Blocks - All Machine Makes & Models! Part Number Code: First List Part Number Prefix – Style. More Tool Blocks – All Machine Makes & Models!